Cast Iron 101 – How to season and care for your cast iron skillet! I received a cast iron pan as a Christmas gift from my mother-in-law. A couple days later I was talking to my husband’s grandmother (Grandma Z. ), telling her about the pan. It was actually the second one I had owned. The first one we received as a wedding gift. It just sat in a bin downstairs in our basement for at least three years. I finally sold it at a garage sale I had one summer because I just didn’t have a need for it. Or so I thought. What I THOUGHT was that the pan was really heavy. I didn’t like the noise it made if I scraped it against any of my other pans and I knew FOR SURE it was not going to be easy to clean. No thanks. Okay, so fast forward again to the conversation with Grandma Z. The first question out of her mouth was, “Did you season it already?” I looked back at her (kind of a deer in the headlights look) and said, “Did I do what now?” For the next 30 minutes I received my first Cast Iron 101. What did I learn? A lot. She even mentioned that Grandpa Z. wouldn’t let her use any other skillet when she cooked on the stove (especially his eggs). The flavor just wasn’t there. It took awhile, but now I totally understand Grandma Z.’s appreciation for cast iron. Today I’m here to pass along some cast iron tips – how to season your cast iron pan and care for it as time goes on. Some of my favorite foods to use my cast iron pan for are steaks and over-easy eggs. I just used it last week to sear some scallops and they were DIVINE. Okay, let’s get started. We’re going to talk about seasoning your pan first. What does seasoning actually mean? When you “season” a cast iron pan, you’re actually just baking oil into the pores of the pan to prevent food from sticking to its surface. Normally you’ll season a pan when you bring it home from the store brand spankin’ new. Now, some pans are sold already seasoned, some are not. If you notice that food is sticking to your pan, it’s most likely not seasoned. And if you’ve had your pan for awhile and notice that food has started sticking to it again, you can reseason it at any time. You begin the seasoning process by washing the skillet with soapy water and a plastic-bristle brush. This is the only time you get to use soap and water on your cast iron pan! Alright, let’s keep, keeping on. If you notice there are some food bits stuck on the pan, use coarse salt to scour the pan, then rinse it and dry it well. Take a paper towel and rub a thin layer of vegetable oil on the inside and outside of the pan. Now, preheat your oven to 350 degrees. Line the bottom of the oven with some foil and place the pan upside down on the top rack of the oven. Allow the skillet to “bake” for one hour, then turn the oven off and leave the skillet in there to cool. 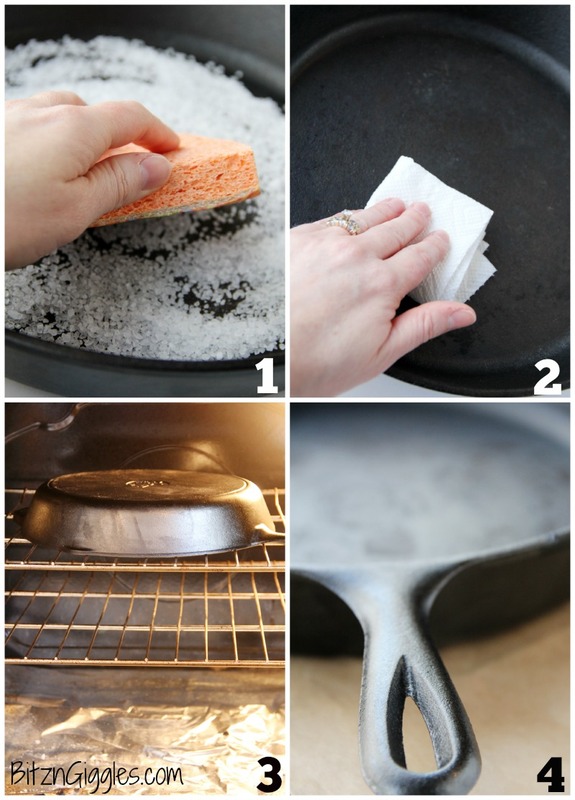 Store your skillet in a dry place without any cover. If your skillet has any rust on it, it’s probably because it was put away wet or has been stored in too humid of conditions. 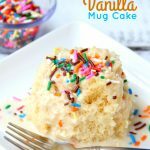 What do I do after I cook something in it? Rinse the skillet with water while it’s still warm. Remember NOT to use soap. If there are any food bits, repeat step #1 above, using coarse salt to scour the bits away. This also helps to remove any flavors or odors that may be left from your delicious dinner you just cooked in the pan. Dry the skillet using paper toweling. Cast irons pans WILL stain towels. I learned this the hard way and ruined a flour sack towel my grandmother had given me years ago. Boo. Rub a few drops of vegetable oil on the inside of the skillet with a paper towel to restore its sheen. Store in a dry spot. Are you sure I don’t have to use soap to clean the pan? YES! The pan heats up so fast and so hot that it will kill anything left on its surface. Don’t EVER put the pan into the dishwasher. The detergent and humid conditions will ruin the seasoning and encourage rust. Tip: If your pan does rust, scour off the rust with salt and a plastic-bristle brush, dry and reseason. Okay, so that’s basically it. ENJOY your cast iron skillet and take good care of it. Cast iron can last you MANY years and can be passed down from generation to generation. If only I knew back then what a special gift we had received for our wedding. Well, live and learn I guess, right? If you’re a newlywed reading this post who also just received a cast iron pan, PLEASE keep it. Don’t make the same mistake I did. You’re going to love it. Believe it or not, flavors from the pan get better and better as time goes on. If you have owned your cast iron skillet for awhile, I’d love for you to share any additional tips or tricks you may have, as well as favorite foods you love to cook in it. Ready to Ditch the Clutter? If you feel like you're DROWNING in "STUFF" and are ready to break through the clutter, there's no better time to start than right now! Awesome! You're one step closer to a clean, simplified, de-cluttered home! Check your email and download your FREE ebook! All is not lost! LOL You can reseason it at any time. Thanks so much for the nice comments, Janine! I really don’t know how to leave a comment on your blog, so I’m using this reply space. I read that you ruined a towel that was valuable to you by placing the iron pan on it. If you have not tried it or heard of it, and if you still have the towel, you may want to try a product called Iron-Out. I’ve had such good luck with it removing iron stains from clothes, sinks and other things. It has even removed color stains from fabric for me. Just a thought… and thank you for your great blog! Sandy, what a GREAT tip! Thank you! I’ve never heard of that product, but I certainly will seek it out. Thank you for such a helpful and sweet comment! Jenna, what a sweet compliment. You truly made my day. Thanks for sharing the post! I have a cast iron skillet that i seasoned and used a few times and now it turns any thing I cook in it a greyish color. What am I doing wrong? Brittany, the only time I’ve ever heard of a cast iron pan turning food gray is if you’re cooking something too acidic in the pan like tomatoes that reacts with the iron. Think back to what you’ve made in it. If the ingredients haven’t been acidic, there’s a good chance you unfortunately just have a bad skillet. I would probably get rid of the one you have and start over again, taking care not to cook anything acidic in it until it is WELL seasoned. We use ours to make homemade spaghetti sauce all the time and never had a problem. My dad used his iron skillet to make his spaghetti sauce also and never had any problems. It’s true that our pans were well seasoned. We use ours just about everyday. Stan, your pans sound like they are well-seasoned. I know they caution against acidic foods early on, but as you use them more and more, it makes sense that they’re able to stand up to something like spaghetti sauce. I baked the pan for 1 hr with olive oil…it is still sticky. Should I try veg oil???? Shoul I use salt again??? I’m frustrated!!!!! It sounds like you may have used a bit too much oil and I recommend using vegetable oil over olive oil. Scrub the residue away with a stiff brush or some kosher salt and then re-season. This time, wipe the pan out with a paper towel while the pan is still hot to remove any excess oil that may still be in the pan. Remember that a little oil goes a long way! Two points on the grey food. Is it black flecks or grey streaks/entirely grey. If its black flecks, then there is probably burned food in the pores of the skillet. Simply scrub clean and reseason properly. If it is a greyish matter, then it could be iron leeching from the skillet into the food. Other than for visual reasons this is not an issue and is actually healthy. My Grandma taught me to season my pans with lard. If I don’t have lard then I use olive oil. I use them to cook everything except tomatoe based sauces because the song acidity raises cain with the seasoning if the pan! Your comments about the rest are spot-on with what I have learned from 3 generations of ladies that still predominantly use their castiron! Niki, you’re absolutely right about the lard. In fact, lard actually works better than vegetable oil. Vegetable oil can, at times, get a bit sticky. I’ve never run into any issues with it, however. You are also correct about steering clear of acidic ingredients. One of our readers commented how her food was actually turning gray in the pan. I think it had something to do with the acidic nature of what may have been cooked in the pan. Thanks so very much for your helpful, useful and thoughtful comments! I also got one for Christmas. We have used them for years camping and outside. I use to use them in my kitchen too. I seriously don’t know why I quite, but after going through so many pans that just don’t last, I’m back to cast iron and loving it!!! Great post! I had a Grandpa and Grandma Z. too Zimmerman. Thanks so much Wanda Ann! I’m using my skillet more and more now. I have big plans for it and will definitely treat this one better than I did my last. My family will tell you that everything tastes better in cast iron. Grandma Z. told me that Grandpa wouldn’t let her use any other pan for his eggs. 🙂 Also, we have several Zimmermans here in Central Wisconsin. Have a great rest of the week! Your tutorial is spot on. Everyone beware, not all ‘cast iron’ is a true cast iron. Old label GRISWOLD and WAGNER’ are the best. Lodge and any others have a bumpy, rough surface and difficult to season and clean. It’s too close to Korean cast iron (unknown name) which blends two types of metal, has a bumpy surface and does not season well. Lard, salt pork or cooking bacon in the cast iron is best for seasoning, i.e., animal fat. Olive Oil is second best for keeping it seasoned in-between real seasonings. If you need to start over, burn it in a pile of leaves (the way it was done many years ago), or broil it in your oven, or use a blow torch. I’m 63 years old and have some experience with cast iron skillets. I love mine and bought sets for my two boys. Nothing better! Thank you for sharing your knowledge! I may stick to the oven for seasoning rather than burning the pan in a pile of leaves or blow torching it. Just to keep my home and family for the most part. LOL All kidding aside, THANK YOU for sharing. I’m learning so much from all of you ladies! Oh, I had never heard of the salt trick to clean it up. I have a cast-iron skillet that I have only used a few times, but after reading this I am inspired to use it more! Thanks for sharing, stopping by from Wonderful Wednesday Blog hop. All of you who have commented on this post are inspiring ME! I can’t wait to cook with mine again either! What to make, what to make. . .
My husband treated me to two cast iron pans for mother’s day one year and now I find him using the all the time as well! My neighbours told me they threw out their rusty cast iron pan and I almost cried! Great info! Yes Kacey, that rust on your neighbors pan probably would have come off with some coarse sea salt and a brush. You’ll have to “school” them on how great they are! Cast Iron pans are the best, I use mine everyday! Thanks for the reminder- mine is definitely due for a re-seasoning. Love the tip about cleaning with salt- definitely trying that today! I bet we all could learn a thing or two from you, Sherri! I would love to know what your favorite food to cook in it is! A FEW?? I’m so jealous, Beth. I really want one of the mini ones so I can make a big chocolate chip cookie or something in it. Season them up and I expect to see a recipe out on your blog that was cooked in cast iron soon! I’ll be watching! I love my cast iron pan. My mom recently bought a second one for me at an antique store and it is as smooth as glass. Thanks for the great info about the salt, I will have to get some. Ooh, Becky, your pan sounds like it was a great find. The older pans are sometimes the very best! I have 2 small and 2 large ones, all passed down from family so they have to be like 30 years old…we’re from Georgia, I’ve never used anything else. Pancakes, cornbread, grilled cheese everything is done in ours, I hope my daughter appreciates them when they’re passed to her. Thanks for the cookie idea! Table salt will work just as well. Their surface should be smooth, not bumpy. Old Griswold pans or Wagner are still the quality above all else. Such a helpful guide! I have a cast iron skillet but rarely use it – I need to clean and season it and get cooking!! Yes, Cate, get that baby out and start using it! You’re going to love the results! Awww…how sweet that she gave you all those tips! I love how wise our grandparents are. That’s so true, Tonia – they are wise. I’m always learning something new and today as an adult, I really appreciate it! I have 3 of them and love them so much!! I love my cast iron pans. We just bought a cast iron griddle for the stove top, grill marks on one side, griddle on the other. Both it and the skillet are just stored on the stove because I use them every day. Your griddle sounds amazing, especially when it’s winter and you want grilled food. I think I need to go shopping! Andie, neither did I! I sure got a lesson, didn’t I? Thanks for the sweet compliment! I LOVE LOVE LOVE my cast iron skillets…heck we even have a cast iron pot…I also want a cast iron pan! Sounds like you’re a big fan, Karen! I was talking to my hubby about those scallops I made in ours the other night and we both agree they should happen soon again! Tell us more about those scallops please. I stayed away from cast iron for many years because I thought it was a lot of work, but you have made it sound easy to use. Thank you. Cindy, I’ll have to put together a post on my scallops. They’re SO easy. Wash and dry the scallops well before preparing. 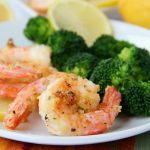 Sprinkle them with some salt and pepper – I also use Old Bay seasoning on mine. Put a combination of butter and olive oil in your skillet and sear each side for about 1 1/2 minutes when a beautiful golden crust starts to form on the outside. Sara. Do you coat the scalllops with flour or anything before putting them in the skillet? This is such a useful and well-written post, Sara! Thank you! Thanks for the sweet comment, Andi! Thank you for your post, it was just what I needed to gain the courage to start using cast iron. It has been rumored that if you have an iron deficiency that using cast iron can actually help you by adding iron to your food. Do you know if there is any truth to this? Also you mentioned using yours for a chic-chip cookie, can you regularly bake your pans? Thanks again for a great post! Jenny, cast iron can add a bit more iron to your food especially when you’re cooking something that’s more acidic in nature in the pan like tomato sauce – the reaction with the iron is quite great. Stay away from too acidic of foods, however, until your cast iron pan is seasoned well. And as far as baking, cast iron pans are made to go from burner to oven. I cook filet mignon using my cast iron pan. Searing both sides for a minute each and then putting the pan directly in a 450 degree oven until steaks are cooked to desired temp. Oh, cast iron from stove to oven makes the BEST filet mignon! I made them that way for my BIL, seasoned with just sea salt and pepper, seared in some butter that browned in the oven with the steaks. He couldn’t believe that the only seasoning was salt and pepper. You’re making me so hungry, Jenni! Love my cast iron skillet. Mom always had one, and mine is going on 15 years old 🙂 It’s the ONLY pan I’ll make fried potatoes in. And in regards to baking….as a young girl I made my first pineapple upside down cake using a cast iron skillet. Works great to melt butter and sugar on the stove top, add the pineapple and cherries, then the cake mixture – all goes into the oven! What great memories for you! Your pineapple upside down cake sounds so tasty! My family also prefers fried potatoes made in a cast iron skillet. They just don’t turn out right when made in any other. Unfortunately cast iron does not do pretty things to a ceramic top stove. Other than that I love my skillets. I have a pot too and need to pull it out and use it. Brooke, cornbread sounds delicious in the skillet! Good luck with “revitalizing” your existing pans! A tip I read..after washing wipe cast iron pans with used tea bags–the tannins in the tea create a rust preventing layer! Haven’t tried this myself but clipped the tip out from a magazine 100 years ago and have it in the cabinet shelf by my “CI” skillets!! Thoughts on this? Mindy, I haven’t tried it either, but I have also read the same thing. Thanks so much for sharing this tip in the comments! after wipe it out after cleaning I add a little oil and store in the oven.. if the food was cooked in the oven it helps it dry and the oil soak in… and it is always ready to go next time. 🙂 many of nine were from my grand mother and a few probably 80+ yrs old. Wow, Laura – it sounds like you have quite the collection! The dutch ovens must be quite heavy. I have to use both hands to lift my skillet when moving it from the stovetop to the oven. I can’t imagine a big pot like that. So worth it thought! You sure have a lot of deliciousness going on in your kitchen!! it is very heavy… cooking on stove isn’t bad but sometimes hubby has to get it out of the oven when I cook a large roast and gravy in it! I think you’re on to something, Laura. I just need to enlist my hubby for help in the kitchen! Thank you so much for informing people of this. I’ve had a stack of cast iron skillets in my cupboard for almost a year that my father in law gave me. Most are rusted and I hadno idea how to care for them. Tomorrow i am going to do everything you instructed. Again thank you for sharing this knowledge!!! Ashley, you may need to use some dish soap to get all of the rust/oil off the pans when you clean them. Just put them through the seasoning process after you remove the rust and you should be good to go. Good luck! Yes, so true, Marcy! In fact the next time I visit Grandma Z. I’m going to be checking out her pans very closely! i love to make cornbread in my skillet. It is always delishous. I’m an 74 year old and learned to cook with my cast iron many a year ago from my gma and my aunt, I have five pans and use every one all the time. The small one is my fried egg only, the lg. deep one is used for frying chicken, great!! They are all great and love cooking with them. My youngest son said, mom, I get your cast iron when you’re done with them, right!! Right on, there are his, used, years of seasoning and ready for another generation of cooking. The way you are telling everyone on how to care for them, right on the money! Your comment just warmed my heart. I love that you have one pan just for your fried egg! Your youngest son sounds to be wise beyond his years. Take care and God bless! Until I was grown and married I didn’t know there was any other type pan. That is all my mother ever used. She has several of them in varying sizes. She will be 90 on her birthday in April. She has one that she has used so much it has cooked the pan thin. She said the handle fell off years ago. It had an attached handled it was not a solid one. She used it for biscuits and cornbread. Neither ever stuck in it. I have a small about 8 inch that I use for cornbread. Then I have a regular size that my mother bought for all the kids several years ago. I have one that was a hand me down in my husbands family with high sides and another small one that has a lid a sweet lady gave me when she was cleaning out her mother’s house. My problem is the weight of the pans. I severe arthritis and have trouble lifting them empty little lone when it is full of food. They are great though for about everything. You should certainly keep your mother’s pan in the family! What a great story. Sounds like your mother is a big fan of cast iron seeing as she bought one for all the kids. I hope they continue the tradition. I absolutely agree with you about the weight of the pans. I need to take a deep breath and prepare before I try and lift mine – especially with food in it, like you said! hi I have my moms cast iron skillet..would love to cook in it but I have a glass top stove. I have heard that you can’t use cast iron on that type of stove. Is that true? Thanks! I sure hope that’s NOT true, Rose because I also have a glass top stove. I think you need to be careful not to “drag” the pan across the stove top or “drop” it on the stove top, but I think if you take care you should be fine cooking with one. I do and so far, so good! Thanks for the tips. I can’t wait to try this. I do cook with cast iron, but I have never been able to keep things from sticking. I season with vegetable oil, but don’t turn the pan upside down in the stove. Hopefully that’s the secret! If food is sticking to your pan, Julie, go through the steps I outlined to re-season your pan, but turning it upside down in the stove isn’t something you need to do each time you use it – just for the seasoning. I have 6 castiron pans, love every one of them and use them daily. These came from my mom and one was a wedding present 56 yrs ago. But I have a dutch oven that is not in use until I can solve this problem. It is old like all the others I have but everything I cook is almost black so I don’t use it. I thought that it possibly needs a good cleaning and seasoned again. Would that help?? I can’t use it as it is now. Thanks. Hi Betty, YES, your dutch oven needs to be seasoned again. The only other reason food would turn black in a cast iron pan is if you’re leaving the food in the pot after it has been cooked. It should be removed immediately. Try seasoning it following the steps I outlined and let me know if you get it back to it’s original condition! Good luck! An easy way to help smooth your pans is to use metal spatulas/spoons while cooking. It will wear down the surface over time and by scraping against the pan you are shaving iron particles into your food which is an added nutritional benefit. My parents have cast iron that they have been using for years and some of them are as smooth as non-stick pans at this point! Great tip, Michelle! Especially about using the metal spatulas to shave some iron particles into the food. I’m working hard to get mine smooth as glass! Thanks for the tips! I can’t wait to try cleaning with the salt! I am so upset that I threw out my grandmother’s cast iron skillets after Hurricane Katrina! I was so traumatized and thought that they where contaminated from that nasty water. Oh well! At least I do have two skillets I purchased after the storm. I use them to cook everything from breads and steaks to pineapple upside-down cakes! Even if you no longer have your grandmother’s cast iron skillets, maybe you have some of her recipes you could make in the ones you own today. Sounds like you’re already getting some great use out of them! I remember my grandmother always cooked in her favorite iron skillet, it stayed on the stove top. When she would clean it it was usually a quick wipe, if water touched it was placed in the oven to heat till dry. After 30 year I have picked up a fry pan. My husband had one from his single apartment days, the only kitchen thing of his we kept. I finally got tired of the pan’s sad state. Last week I took it back to metal, tried several ways of doing it but finally the only one the worked was the self cleaning oven. Took off the rust, crud and mysterious black stuff. I seasoned it with Organic Coconut Oil after some research it was the best oil I had on hand with the highest smoke temp. I read that Flax seed oil was a preferred modern oil, but wasn’t go’n searching for it. Most lard readily available today is not your g-ma’s lard. I love my beautiful pan, every time I look at it (on my stove top) I smile….I just don’t want to get it dirty, it looks so pretty…..sniff, sniff. Another tip that I learned in my extensive on-line research of all things C.O. frying pans was that ….it is best to use your pan EVERYDAY, it cooks better and keeps it’s seasoning in better condition. So many folks are talking about making corn bread in their cast iron pans. I need to try that! I also will try making sliced potatoes the way you described. I just made dinner in mine yet again tonight. Seared chicken breasts and then cooked the rest of the way in the oven. Delish! I love making cornbread in my fry pan. I have an old recipe that says to put your pan with butter/oil in the oven and heat it up before putting the corn bread batter in. Even with poorly seasoned pan, it did not stick. I didn’t know you could make cornbread in anything else…I melt a bit of bacon grease in mine before pouring the batter, crunchy yumminess on the outside delicious buttermilk soft bread on the inside. I feel the same way, I didn’t know any other way to cook cornbread than in a cast iron. I too, put it in the oven while preheating to get the oil/fat/grease hot then pour the cornbread into the hot pan. It makes a crispy edge. Also always let your cornbread “rest” after mixing and before baking, this will let it “rise” for a nice crown. I have a cast iron for cornbread that are sticks that look like ears of corn for individual servings, so cute and doesn’t crumble like in a round pan. Y’all should check campfire cookbooks to find other recipies made with cast iron. 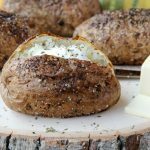 Tips like using a Dutch oven to it’s fullest. I live in Texas and some cook offs categories are for entries with cast iron only. When they moved my grandparents out of their home I got 3 things. A couple of hand made pillow cases, their flatwear. And grandmas cast iron skillets. But not only were they grandmas, they were HER mothers before that. They are truly treasures to me. I would treasure them too, Franny! How special! Thank you for this simple yet profound article. I’ve used cast iron for 22 years but for the past 10 years have used only cast iron (and stainless for anything tomato-based as tomatoes react chemically with cast iron). There will be no traditional “non-stick pans” for me. Every time I mention my cast iron, I get the same response: “It’s not non-stick”, “I could never cook eggs in it because they stick” (eggs are my favorite in my pans), “What? You mean you have to season it? How do you do that?” and my favorite question, “How can I clean it if I don’t use soap?”. I’m glad you finally figured out how much easier cast iron is. Sure, they’re heavy, but they make food taste amazing, and using them has eliminated my need to take iron supplements for my tendency toward anemia. Clarissa, I can’t WAIT until I get some of those questions when having a conversation with my friends. I’ll actually know how to answer now!! I’m so glad I found this. I have two skillets I got at a garage sale that I was too scared to use. I never understood them! So, I cleaned them with the salt, rinsed, paper towel dried, applied oil and put in the oven for an hour. After 40 minutes they were smoking! My house filled with smoke. Did I miss something or is that somewhat normal? Cassie, the smoke is actually normal. You’ll need to turn your exhaust fans on, etc. I hope the process worked for you and the look of them has improved. Now just wait until you cook something in it! After I rinse mine out, I usually put it on the stove on low for a few minutes to make sure it is nice and dry, then put a small spoon full of lard, let it melt, and use a paper towel to spread it over the whole pan. I have only had it for 6 months or so but it is well seasoned already. Sounds like drying the pan out in the oven or on the stove is a great idea! I have a few cast iron pans (I picked most up at thrift stores for .50 each). Duh!!! I LOVE MY CAST IRON PANS!!! I treat them after each use with Crisco, since I don’t usually have lard available. Works great. Never Ever Water!! I store my 2 most used pans in the oven….easy breezy. Since I use them almost daily, I love the east access. And if the oven gets turned on before I remember to remove the pan….no big deal. That’s a great storage idea, Beth. They’re pretty heavy to drag in and out of the cupboards all the time. I can’t believe you’ve found pans for $.50! You are a LUCKY DUCK!! i have 2 cast iron pans, and regularly sear and cook our tenderloin filets in the one. Heat that oven to 450, sear the filets on the stove top in the cast iron first to brown t with a little oil or butter( your preference) then put in hot oven for 7 min. Remove from oven and let stand for about 5 min. They are perfect medium rare. Clean up with hot water and recoil the pan. A snap! But great tips!! Tenderloin filets in cast iron pans are my favorite. Cooking them the way you described make them taste just like restaurant quality! Sara I have 3 cast Iron pans. A #3, #8 griswold with lid, & a #9 flat griswold. I’m a fan if you can’t tell! Use them every day. My comment/question is instead of drying with paper towel, I heat up pan till completely dry & hot and then I apply the oil. Have you heard of this? It seems to work well for us & then there is no moisture! Any thoughts one way or another between the two methods….? I’ve been using them for years, and have brought many sad rusted cast iron pans back to beauty. Some times you must take drastic measures to get all the rust off but in most cases they can be saved! Thanks for any input I’m willing to try something different if it might work better…? Meghan, you method for drying the pan is sound. I think either way is fine. Bottom line is you don’t want to allow water to set in the pan. I’ve heard of many people storing them right in their ovens. I have my Mom’s cast iron skillets and they are very old and well used. I just gave two of them to my daughter. I kept one for myself and love to cook in it. There’s nothing like pineapple upside down cake from a cast iron skillet! I’ve heard that from a few folks who have commented. In fact, one of our readers said that Pineapple Upside Down Cake was the first thing she ever made in a cast iron skillet as a young girl. How cool is that?! Be a Southern lady, I have two cast iron skillets. One medium and one large sizes. There just isn’t any way to make cornbread and get the great crunchy crust unless you use cast iron. Simply heat the skillet on a burner, add oil and continue to heat until very hot. Then pour in your cornbread batter and pop into a 425 degree oven. In about 20 minutes it’s done. Yum ! That sounds absolutely delicious, Ann! i am SO glad I found this before I decided to scrap my one & only CI pan! It was in storage for nearly 2 years & we had a mold issue on much of our stuff. The pan rusted & is in really sad shape. I thought it would need to be refired & had no clue how I could get that done. Not sure if I read correctly that someone “cleaned” a rusty pan by leaving it in the oven while cleaning the oven. I will have to give it a good scrubbing & reseason to see if that will bring it back to life. My husband will be delighted to have a non-stick pan again for frying his breakfast eggs! I’m SO glad you found this post, too! Best of luck to you in trying to restore your pan! YEAH!!! So glad your skillet is back in business! Enjoy, Raquel! Don’t use soap! That may have been what left the taste. But glad it came back to normal in the next recipie. I own 7 CI pans most received from auctions &yard sales, everything from Griswold to the newer Lodge pieces. I also own a Danish Abelskivver pan. It has rounded deep circles to pour batter into. The resulting cakes I called pacman pancakes as they have a lip when turning them. Great for dipping into toppings. My next quest is to get a CI wok I just seen for sale! I cook on a glass stove top and season with flax oil. In my 50’s I enjoy saving the older pans from the trash and giving them to the younger generation cleaned & seasoned with a bit of instruction. Share the knowledge ladies! Ahh. . .flax oil! Another great oil. Thanks for the tip, Laurie! I received my mother-in-law’s cast iron skillets (set of 3) when she inherited her mother’s. I LOVE them. I cook everything in them! If anything ever sticks, which is rare, I place it back on the stove on medium-low heat with some coconut oil and while it’s heating use a metal spatula to scrape off the stuck on food. The oil provides a separation between the food and pan and the heat helps “cook” it off. Then I just wipe it clean with a paper towel after it’s a bit cooler. Works every time. I’ve heard others talk about using coconut oil for cleaning as well. Thanks for the tip! I, like many here, love my cast iron. I am the proud owner of griddles, pans, and Dutch ovens. They are used everyday. One of our skillets is used only for eggs…my husband’s request. Since I have 5 children, my current favorite is my huge 14 inch skillet. Our favorite foods to cook in cast iron are eggs, cornbread, and roast chicken. I do use my cast iron for tomato-based foods and have never had issues with it. Thanks so much for writing this article. I know there are many who don’t know how to properly care for cast iron. Hopefully more people will discover the diversity of this material and forget about the non-stick pans! You’re making me hungry already this morning and it’s amazing you’ve used your cast iron with tomato-based foods with no problem. I’m guessing yours is seasoned very well! I have several cast iron pans in various shapes and sizes and I LOVE them. I use them at home and camping. From stove to oven to fire pit there is nothing better. I love cooking just about everything in my cast iron….but I have to say its the only way to make your cornbread! YUM! What a great tutorial!! I had no idea you shouldn’t use soap after the first time, and mine has been sticking lately, time to give this tutorial a try and re-season it! I love making anything involving gravy in my cast iron, such great flavor! Thank you for sharing! If you have a gas oven and don’t have an issue with it – after cleaning mine I always rub it with oil/fat/bacon grease (usually) and store it in the oven. The mild heat from the gas oven will keep it nice and seasoned over time. I have a fryer, a skillet, two griddles in my oven at all times – I have a roaster, a Dutch oven, and a cast iron pot that I often stick in the oven for a few days after use just to keep them looking good. My family believes in cast iron – my grandfather taught me to season them and all of my pieces, other than one, have been hand me downs which I treasure deeply. i have my great grandma’s CI and several others. We use duch ovens on scout overnights to cook everything from stew to the best cobblers you have ever eaten. I’ve never tried salt we have always rolled aluminum foil into a ball and rubbed the CI clean. Sausage gravy and homemade cinnamon rolls are always better cooked in cast iron. Shari, while I read your comment I could hear the aluminum rubbing on the pan!! I’m sure it works well! I don’t know if I could take the sound! Cinnamon Rolls in the cast iron pan sound wonderful! Hi! Great tutorial! I have a set of cast iron pots and pans, but they have wooden handles, so I’ve never used them…not sure how they would stand up to seasoning in the oven, which is how I use my regular cast skillet. Was wondering if anyone else has had a pot like these and how they seasoned/used it?It’s a great set, so I would really like to use them instead of buying a cheap new set. Thanks! Dana, you DON’T want to put your pans in the oven for seasoning. There’s another method for you! Turn one of your stove burners on, put the pan on it for 1-2 minutes until it gets pretty hot. Then, while on the burner, brush the inside of the pan with vegetable oil or lard. Leave the pan on the burner for 2-3 more minutes. Remove from the burner, let it cool, wipe off the excess oil and allow to dry completely. There you go! USE THOSE PANS! Good luck! I have acquired a couple old cast iron skillets. They are nasty, dirty – left outside, animals have gotten in a box with them and messed on them, etc. So I’m not really comfortable not washing them and just rubbing with salt. Is there anything else to do to clean them good and then I could season them and start using them? Stephanie, you can clean them with dish soap and warm water. Once they’re clean, put the skillets through the seasoning process and you should be able to use them! THANK YOU SO MUCH! 🙂 I am very excited to start using these pans. I have several cast iron pieces and use them daily! For everything including tomatoe based sauces. I actually just made pancakes on my griddle for breakfast. I rub butter on the pan and then fry the batter it makes this fantastic crispy buttery edge that just doesn’t happen with traditional nonstick pans. I love them for sausage gravy , it gives the best flavor. My grandad used to buy the old ones at auctions and yardsales to restore, the ones from him are my favorite pieces. If I use water to clean them I put them on the burner to dry and then rub with oil or lard to season. I have not tried the salt before but i will give it a go. Thanks for your post! Ooh, those pancakes sound fantastic! I just purchased a cast iron griddle the other day with pancakes in mind!! I love my cast iron skillet, I’ve been using it for years. My mother had one and used it all the time. I don’t know if anybody has said this but after I clean my skillet I put it back on the burner and burn the water off it. Yes, great tip, Virginia! A few readers have said they do the same thing! Lee, it still sounds like your pans are holding up for you. It’s amazing you haven’t had any problems with rust. Hey, I’m all about easy cooking and you seem to have it figured out! Thanks for sharing such a helpful article, Lee!! Great post! I have a small skillet that has been in my family for around 100 years and it is like silk! I have a larger pan that I have been using for about 10 years. I season mine on the stove top. I didn’t like using olive oil because it was too sticky. I was using vegetable oil until one day a was out and used peanut oil. It was fantastic! It held up well to the high heat and left a beautiful glossy finish! This is now my regular routine! Happy cooking, everyone! I like the idea of using peanut oil, Kathleen! I may have to try that! Thanks for the tip! Instead of drying mine with a paper towel, I was taught at a young age to rinse thoroughly with water after use (NO soap) then immediately put it on a hot burner until dry. emove from burner and then pour a little oil and salt in the hot pan and scour with paper towels and then dump the salt and paper towel into the trash. Salt kills any left over germs and heating on the stove insures that there are no remaining damp areas to rust. GREAT tips, Lisa! Thanks for sharing your knowledge! Mom (now 84) tells how her mother would take her skillet to the creek & use the fine sand to clean it. She’d rinse it out, dry it well and it was ready for the next meal. I have cooked with cast iron for years. I have 5 fry pans of different sizes. I also was just given a cast iron roasting pot with lid. It’s pretty rusty. I will try your technique. I LOVE my cast iron and pretty much use every day. I have also seasoned pans for other people. One step more that I do than you. After rinsing in water, I put it back on stove and heat to dry all the water out before coating with oil. I also have my Grandmother’s cast iron skillets. My sons lost my regular one on a camping trip,so all I have left is the deep one. I make my roasts in it. Just fill half way with water put the lid on and check it every once in a while and the roast is amazing,and tender , then you can make the gravy too. Now don’t be mad, but these skillets are old and i have put it in the dishwasher a few times and many times in the dish water. I have never re-seasoned them and i absolutely love them. I miss my regular pan for eggs and just general cooking , and yell at the boys all the time about my pan. Thanks Grandma. Amazing that you haven’t had to re-season your pan! Get mad? Sheesh. Never. I just wish I had a cast iron pan I could put in the dishwasher and still work great afterwards!! I got a cast iron fry pan for Christmas last year it’s by Emeril Lagase, do you know if that’s a good fry pan? It does have little roughness inside so I don’t know if it will ever get smooth. I am following the directions about keeping it seasoned. I checked the bottom for the names you suggested and it doesn’t say anything but Emeril. I hope it’s a good one. I’m assuming that your pan is pre-seasoned by how you described it. I’m not sure it will ever get smooth like the older pans, but I’m sure it’s well-designed. Lodge is the other brand that’s quite popular. As long as you’re not experiencing a lot of food sticking on the pan when using it, it’s working as it should! Oh my goodness, Cindy. That sounds divine! An easy way to clean rust from cast iron is to use beeswax. Heat up the cast iron item and melt some beeswax to make a pool of liquid. Wipe out the excess and you can do the oven seasoning. The beeswax can also be used to touch up the seasoning after each use as you would an oil. Use a 100% cotton cloth to wipe out the excess. Save the wax filled cloth as it can be used to give the item a quick wipe if you reheat for drying. I was given as a wedding gift a cast iron pot and skillet that when put together can also be used as a Dutch oven. I thought it an odd gift but did use them for camping. They made the best cornbread and chili. More recently I have been diagnosed with an iron deficiency and read how cooking in cast iron can help, so I pulled the pot and skillet out of the camping equipment and now use them every day for my eggs and many other dishes. I love them and wish I had been using them all along. I season mine with cisco which works well. I also dry with paper towels. However, I must not have dried well enough, put them away and some rust formed on the bottom. I just tried your suggestion with salt and it worked amazingly well. Thank you. I’m sure your towel is long gone but, just in case you don’t know, Barkeepers Friend takes rust stains out of fabric. I have used it for years. Look for it with the sink cleaning products at the grocery store. Thank you for the tip, Lee! I’ve heard of Barkeepers Friend but have never used it. I’ll have to try it out! I love my old cast iron skillets as well! I use them more than any other pan I have in various sizes and styles to cook everything! The way I season them is to put a very thin later of (oil of choice-my preference is flax seed oil but I use bacon grease as well), start in a cold oven, and turn it on to 500. Allow to bake for 1 hour… turn off oven and leave them in until cool. I know this is super high heat, but it has worked perfectly for me for years. I usually do about 3 cycles of this depending on the need of the pan. Putting a super thin layer of the oil prevents stickiness. Patience is rewarded! I have had trouble with the Log Cabin brand skillets as well. I can never get them to stay seasoned properly, and own one that flaked so bad after multiple seasonings that I stripped it down to the bare iron to start fresh. After all that, I have read in addition to someone else’s comment about the Log Cabin cast irons being an alloy (more than one type of metal) but also that the coating they have on them is very toxic and should be removed and reseasoned if you choose those as your pans. I have considered grinding or buffing the bumpy texture from mine since it isn’t as high quality of a skillet as my others. I have a cast iron dutch oven and a 12 in cast iron skillet. The skillet I just bought and used last night to cook up some steaks for valentines day for my boyfriend and I. They turn out delicious! Bought my dutch oven I used a few time and alread has some rust on the inside. So glad I found this post so I can fix it and start using it again. Also could I season with coconut oil? I really like the flavor of coconut oil and thought it might work to reseason with. Thanks for all the awesome tips! Your steaks sound like they were wonderful! I’ve never seasoned with coconut oil so I’m not sure. It may not be able to take as much heat as other oils? I’m not quite sure about that. Thanks, I had no idea. What are your thoughts on storage? Right now my 2 skillets store in the oven and stay there during baking other dishes. So they heat and cool each time we use the oven. It’s okay to store them in the oven. I have mine in a kitchen cupboard that we open and close frequently to keep the air circulating! Carolyn, Even your rusty cast iron can be saved and re-seasoned. Never throw it away! You can used steel wool or even a wire brush or as mentioned by a 63 year old in comments above, a propane torch to burn off anything in your skillet or to scrub off all the rust, then thoroughly season it. Think about the purpose of running a self-cleaning oven cycle…it basically turns all food spills in your oven into coal dust that you later wipe away. My mother taught me to use solid shortening or lard to season my cast iron. Some people recommend doing several repeats of seasoning to get a thorough “season” on your cast iron. There is a good instruction about fixing burned on/ rusty cast iron dutch ovens at : dutchovendude.com that will probably help you with your rusty skillets. The one thing I told my parents that I would like to inherit from them was the 12 inch cast iron skillet my mother cooked in for my whole childhood. She cooked everyday in it and we took it camping with us and every time I use it, it brings back memories of those times for me. Who’d have ever thought you could get emotional over a skillet, but I hope my children have some fond memories of the food we’ve cooked in it when I am gone. I love stories like yours, Susan! This really made my day! I’ll be sure to share with Grandma Z. as well! Always good to know how to season the ol’ cast iron cookware! I got some for Christmas and they’re due for a good reseasoning. I love my cast iron because, as the name would suggest, each time I cook in it my food gets a bit of iron added to it – that’s something that all girls can use, am I right?? Also, the flavor totally does get better over time! Thanks for sharing this helpful tip! Is seasoning a cast iron Dutch oven the same? I’ve come across some as my girls are getting into Girl Scouts and we are doing more camping. Dutch oven cooking is one of the best ways to cook on the fire, I’ve heard :). Jennifer, I would think the care would be similar if it is cast iron as well. Good luck! I pinned this post because we inherited a few cast iron skillets with our new to us travel trailer. If you’re not real sure about how much they were used by their previous owner, I would just go ahead and re-season them. Enjoy them! Robin, I’m SO glad you found the post and it warms my heart to know it helped you!! Thank you for your comment!! I have used cast iron since I was a little girl. My mother now has my grandmothers set of cast iron. She purchased a set for me as a wedding gift, I cant wait to use them. My mother has always seasoned her pans with Crisco and to try them off she just puts them on the stove and turns on the burner for a few mins until they are dry. My dad found an old cast iron skillet at the Goodwill, it was covered in rust, he came home dropped it in a 5 gallon bucket full of vinegar for a few days, scrubbed it, seasoned it and now it is like new. My family only uses the Lodge brand, my parents swear they are the only true cast iron company left. I only buy Lodge as well! Thank you for sharing your family’s cast iron tips! The best cast iron skillet I have was my great grandmother’s that dates back to the mid to late 1800s. I just made over easy eggs in it this morning with no sticking. If you want a true cast iron with no factory coating on it, visit your local antique shops, estate and garage sales or flea markets. I got rid of a newer Lodge in favor of an old but smooth Wagner Ware cast iron pan I found at a flea market. There is no comparison. I love hearing stories like yours about things that have been handed down through the generations. Your great grandmother would be very happy to know you are still using her skillet and I’m sure it warms your heart every time you use it to make a meal! Thanks for sharing! I work long hours and hate fast food. The night before I marinate a whole chicken in a plastic bag. When I get home I pull out my cast iron skillet add vegetables and my marinated chicken. In 40 minutes I have roasted chicken with vegetables. Its my go to meal twice a week. That sounds delicious, Karen! I would love to hear what’s in your marinade! Thank you so much for this awesome post about Cast Iron Skillets. I just received my first one for my bridal shower and I already used it once! (Loved it) A few questions though…The skillet already came pre-seasoned. 1. Do I have to fully re-season it after every use (with instructions above)? 2. If not, how often do I have to do the full re-seasoning? 3. How do I treat it after every use then I don’t fully re-season? Thanks so much! I want to make sure I take care of it properly so I can have it for a long time! Hi Monica! I’m so glad you enjoyed the post. You don’t need to re-season your skillet after every use. 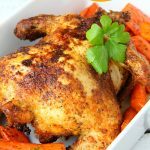 Just follow the instructions on the post in the section “What do I do after I cook something in it?” If you’re finding that the food is starting to stick to the skillet after awhile, it may be ready for a full re-seasoning. Hope that helps and enjoy your cast iron skillet! Great post! I wish more people were familiar with cast. Im 52, and grew up with mom and dad cooking exclusively in cast iron. I’ve inherited all of the cast they had, which started out in grandma’s kitchen. Food is DEFINITELY better cooked in cast, and healthier for you. I use mine in the kitchen, camping, and fishing trips. Lard is best for seasoning and yes, the older Wagners and Griswolds are the best. Every so often, dad would throw one of the skillets in the fire, wait for it to cool, and get to re-seasoning it. One trick that I learned is that no matter how bad of shape a skillet might be in, it CAN be saved. Friends bring their’s to me to save. If it has rusted to the point that it looks too far gone, take a wire brush to it and scrape the flakes off. Place it in the oven in self-cleaning setting and leave it. When its cooled, brush it again, then 3-4 cycles of lard and back in the oven upside down, at 250-275 for about 20 minutes each. It’ll be just fine. I have 7 skillets, in various sizes and depths, and a few dutch ovens, too. Nothing better! Thank you for your thoughtful and helpful comment! I think the older skillets are definitely the best! My mom bought me a set of cast iron pots to use with my NuWave cooktop when camping. They are rusting, which I read above to use steel wool to scrape it out…but … they have wooden handles? Can I put them in the oven? I don’t want to catch anything on fire. Hi Kim! I wouldn’t put your pots in the oven unless you’re able to actually unscrew the handles. If the handles come off, they’re good to go, otherwise, it would be a fire hazard for sure. Just a quick note, I inherited my grandmother’s cast iron skillet and outs the only thing I will fry chicken in, it’s the best. Have you ever done ‘oven fried chicken’ in your cast iron? Just get the oil hot in your skillet on top of the stove, roll your chicken in flower, and add it to the hot oil. Put into a 350 degree oven, and after 30 minutes, turn it over, and cook another 30 minutes. Just like on top of the stove, except that it won’t burn in spots, and cooks evenly. 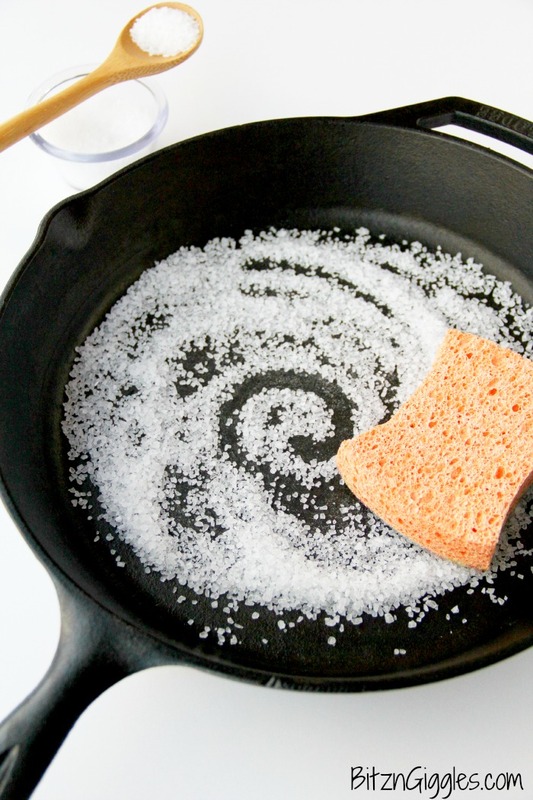 If you live in a humid environment, you can pour some salt in the bottom of the pan to keep it from rusting. Works like a charm. I’m thinking of getting my hubby to take the sander to my pan. I tried making pancakes today and it was an epic failure. Every time I rinse the pan and dry it with paper towel black film comes off the pan. It’s been doing this for ever. I scrub it with steel wool and it just keeps letting off the black stuff. I try seasoning it over this but to no avail. Only really greasy food cooks well in it. I don’t feel this black stuff (charcoal maybe). Is good for is. Is this what ruins others dish towels. I’ve learnt to use paper towels. Thank you for this post I came across it having an insomnia moment, I actually read every comment as well! I’m super excited about all the possibilities with cast iron. I have one skillet and thinking of getting rid of my other post and pans and replacing them for a cast iron set. I am a newly wed 2 weeks in and I’ve been searching for recipes so I can start cooking, planning meals and developing a routine with my husband he is big on flavor and likes to eat healthy. I will be going to goodwills and antique shops to see if I can find a griswold or Wagner for some added flavor. What is a brand that I can find in stores now? Thank you again for sharing your knowledge and thank you to grandma Z for schooling us all!!! Congratulations on your recent marriage! How exciting. I love that you’re excited about meal planning and cooking. It’s so much fun to cook for someone else, isn’t it? Lodge cast iron is a very popular brand these days – definitely one I trust. The best cast iron can be found at garage sales and second-hand shops just like you said. Good luck and thank you for such a thoughtful comment! Great info on taking care of Cast Iron, Thanks, us guys need all the help we can get! You are so welcome, Sid! I recently “retired” all my nonstick pans where the nonstick coating wasn’t perfect due to concerns about the toxic nature of the stuff in the coating as it breaks down. I’d been thinking of trying cast iron – that’s the only skillet my mother ever used – and started w/a Lodge pan. After 4 attempts to season it I wondered what I was doing wrong, as it never developed a smooth surface. The cheap metals from overseas scenario sounds right. I’ve since bought 2 on eBay – one single serve size & one #8 – and the #8 is smooth as glass! There’s not much I haven’t cooked in one if them. I’ve even boiled water for pasta in the Lodge, since it doesn’t give good results for many things. What a lot of people don’t know is that you can use cast iron on an induction surface. I’ve recently had to move to SMALL temporary quarters w/cheap appliances, and bought one of those induction burners in self defense after learning I could use my cast iron on it (no new pans to buy!) I also like being able to start something on the stovetop & finish it in the oven, which cast iron is perfect for! I find that if I take my skillet off the stove while it’s still pretty hot, add a little water (it will sizzle and bubble), then take my Pampered Chef scraper to the bottom, it’s a cinch to clean up. Just run water over it with a sponge, put it back on the hot stove to let it dry thoroughly, then add oil and rub it in. Nice and useful post. I was not aware of the damage soap will do to an iron pot. I own numerous cast iron skillets, dutch ovens, huge fish frying skillets, corn pone pans, muffin pans, you name it. Most are becoming family heirlooms. Nothing cooks as good as cast iron. I can’t imagine making roux in anything else or cornbread. When seasoning you might want to look into Flax Seed Oil. It is some trouble, 6 cures in a 400 degree oven and it will come out a shiny beautiful black with absolutely no residue….none, nada. Dry as a bone. After treatment a skillet will cook an egg without oil. It will slide around just like teflon. Beats anything I have seen. I love the idea of flax seed oil. I’m going to make sure to try that! You make the entire process sound so easy! Thanks for sharing your great tips with us! I have 2 really nice cast iron pans. I just wish my husband to be would stop washing them with soap. I’ve tried telling him one is his, the other is mine, so that mine is seasoned the way I want and he can deal with his own, but he keeps washing mine too. I know he’s trying to be helpful and telling him the same thing over and over is useless, so sadly, I just don’t use the pans. I have had cast iron pans all my life and love them. I was taught not to wash them after every use. Now my wife would wash them every time they were used. I would season them by beating them up and putting a few drops of veg oil on them. Or so I thought I was doing it right. I have never heard of using salt then putting them in the oven…. now for the really bad news my wife won’t use them at all because she has a glass top stove because it will scratch the glass. She has tried to get reed of my cast irons on serveral occasions. I just put them in a cabinet for later use, now I will have to get them out and season then the right way. Don’t buy a glass stove top oven. So, what if you seasoned the skillet, and baked it in the oven per instructions you had, only to end up with too much oil baked in and it looks like glue? How do I clean and redo the mess. Thanks so much, Z!!! This can happen if you use a little too much oil — the excess oil turns gummy and sticky once it cools. To get rid of it, scrub the “glue” away with a stiff brush or some kosher salt, and re-season remembering to use much less oil. All you need is a dab. Next time you use the pan, wipe it out with a paper towel or clean kitchen rag while the pan is still hot after seasoning to remove any additional leftover residue. Hope this helps! On the homepage of my site there’s a little box for you to put your name and email address in to get signed up for the newsletter. Can’t wait to have you as part of our community! I have a Lodge cast iron skillet and just got a hand-me-down Griswold skillet from 1930s that belonged to my grandmother. The Griswold skillet is smooth as glass. I find that a light coat of Crisco shortening works great for seasoning. One thing I love making in the skillet is pizza! I buy a ball of pizza dough at the grocery store and use half per pizza. Oil the pan well with Olive Oil, spread the dough in the pan and top as desired. Bake at 425 until the top looks done, crust around edges is browned, approx 20 minutes, then move to stovetop and cook over burner until the bottom of crust is golden & crispy. I have used my large cast pan for years afterusing I rinse & clean with soft wire brush place on stove top heat till dry & hot then coat with olive oil and leave on top my stove because I use it daily.b Ray Easter than oven when not new. I think coconut oil or lard works best. These fats will not oxidize in high heat and they really create a non-stick surface. I wouldn’t believe it until I used my pan finally. I was the same way when I first received my cast iron pan! Now I cook everything in it! Thanks for the post! My husband and I just got a set of cast iron pans as a wedding gift and I’m so excited to use them! Thanks for sharing how to season and care for them. I have used cast iron for years, and that’s all that was ever used in my home growing up. I use a Teflon pad to scrub out any food particles that remain after cooking, then place on the burner to dry and get hot after which I spread a little lard on it and put it away. Have not had any problems with this cleaning method over the years. Loved your tutorial by the way. Great tips! Thank you, Donna! Couple of tips from someone using these kinds of pans since childhood.. and now I am 70. Never use soap… which leaves a residue that will affect your food. The hard crystal salt will scour any kind of debris. Please note in the past these pans were cleaned with sand. Do use real steel wool when you clean a rusty pan… the artificial steel wool scrubbers don’t do the small surface cleaning correctly. You want to see a completely even surface when you are done, not uneven levels of rust wear and base surface. This requires major work on really rusted and older cast iron. Wear gloves – steel wool hurts. Oil – everyone says use vegetable oil… suggestion… most vegetable oils have a very high congeal quotient…and they are not very healthy. I recommend a combination oil of 1 to 4 ratio of sesame oil to Rice bran oil or a really high quality extra virgin olive oil that does not go rancid quickly. After you have scoured the pan to a surface clean state, dry it with paper towels (tip: use high quality towels as the cheaper ones will stick to any surface that is uneven). Coat the pan with oil and bake at 350 degrees for one hour at a time until the surface is even, coating with oil ratio between each baking. You want to see a glistening pan… not uneven surface because the rust or other surface imperfections were not removed. I just started cooking with cast iron this past week. Made amazing steaks in them and now I want to do more! What is the proper way to store one or multiple cast iron skillets and can you stack them? Hi Kim! You can place a paper towel between the skillets if you plan to stack them. I know some people even put the skillets in smaller brown paper bags and stack them that way. Fry pans are not the only cast iron cookware. Two more favorites are the cast iron wok and the dutch oven. Use the wok for the best stir fries you ever cooked and the dutch oven which is a big pot with a lid to make chili. Season them all the same way. Good luck and good cookin. Thank you for this! I was directed here by Pinterest! (how do they know I have a new cast iron for Christmas? LOL) I have been using soap to clean mine. Oops. so how do I clean it properly? How often do I season it? I thought I was supposed to do it every time I used it. Hi Lynn, to clean the pan, all you need is some salt and water. I give instructions on how to clean your pan in the post. As far as seasoning, you shouldn’t have to season it again until food starts sticking to the pan. What if you don’t have an oven. Here in Thailand we have gas stoves but no oven. I’ve seen articles on stove top seasoning but none address tge outside of the pan. Csn u help? Very good info for those that don’t know. My dad used cast iron while hunting and camping. I was taught at a very early age the correct way. One of my favorite memories is when he would take rolls and drop them in the hot oil making us donuts. I have used one of my 4 often. Potatoes, steaks, pretty much anything. To include a pineapple upside down cake of sorts. Hi Lynne, If you have rust in your cast iron pan, you may need to do a vinegar soak. Normally it can take a few hours but depending on the level of rust, the vinegar may eat away at it quickly. Keep an eye on it and as soon as you notice the rust is flaking away easily, scrub the pan with steel wool and warm, soapy water. At this point, you’ve removed all of the seasoning on the pan. Dry the pan immediately and then follow the steps in my post to re-season your pan. Good luck bringing it back to life. I know you can do it! I have several cast iron skillets of different sizes. If I have cooked on food that doesn’t just wipe out with a paper towel, I use a coarse salt with a little bit of cooking oil. After I have cleaned off the stuck on bits, I wipe the oil and salt out of the skillet. I do NOT use water. After you wipe the salt out of the pan, you will notice that you will still have a thin coating of oil on the inside of the pan. That’s a good thing! You don’t have to worry about any moisture hiding unseen on the surface that could cause rust this way, and you have the added benefit of having the thin coat of oil that will add to the pan’s seasoning the next time you cook with it. I have my great grandmother’s cast iron “chicken fryer” – she passed in 1957. I also have my mother in law’s identical covered deep cast iron pan – she passed in 1991 at 80. I accidentally discovered the course salt method of cleaning. I love doing chuck roasts low and slow in the oven in these pans and they are great for searing any kind of meat. I also have a 3 piece set of cast iron pans I got as wedding gifts in 1971. Would never give them up. I’ve never done a chuck roast in my pans, Martha, but I love that idea. It sounds like you have a wonderful 3-piece set. I wouldn’t give them up, either! Your advice is almost spot on. However, you left out one very important step in cleaning the pan. IF you rinse it in water (more on that if in a minute), you need to return the pan to the stove and allow it to heat up again so that the water in the pores of the pan evaporates or you will have rust. Now, about that “if” I mentioned. I do NOT use water on my cast iron pans. How do I clean it? I take a paper towel and wipe it clean. 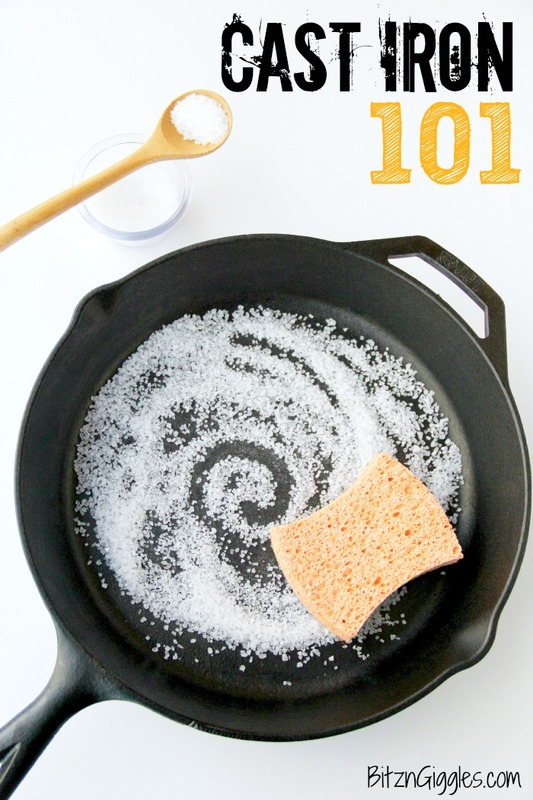 If there are food particles stuck to the pan, I use some canola oil and coarse salt (sea salt or kosher salt) to scrub the pan and then wipe the pan out to remove the salt. This leaves a light coat of oil in the pan and no water was used. I love cooking Reuben sandwiches on mine, the texture of the bread is like no other when cooked on cast iron, and The Taste is so amazing, I have only had a cast iron skillet going on 1 year, and finding that the food tastes so much better. I never knew about using salt as a cleaner to get stuck on food off, thank you for that tip. Your Reuben sounds incredible! I may just have to try that! I’ve used hot water and a wooden spoon to scrape off as much stuck on food as possible then dried the skillet with paper towels, put it on hi heat for one minute to dry completely. After that I use 1/4 c oil and 1/2 c salt and scrub the skillet. I then rinse with hot water then put the skillet back on the stove for a minute. This cleans and seasons my pan. Hi Judy, it sounds like you have quite a job ahead of you with your godmother’s pans. The best resource I could find for you is this: https://www.seriouseats.com/2014/12/how-to-restore-vintage-cast-iron-cookware.html. Good luck!! I’ve always wanted to own one. Now I’m considering purchasing one. I will put this information in mind. Thank you for this informative blog! I will take care of my cast iron well as soon as I purchase one. I cook with my cast iron every day. I have used veg.oil to season my pans, recently I have been using a product called BuzzyWax. Can’t say enough about this product. It’s amazing. It’s a paste made from oil and bees wax. Puts a great finish on the pans. Love it.